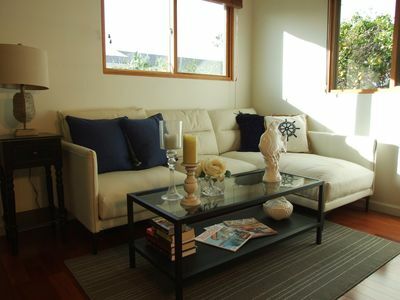 Please message us in advance of booking to ensure this home is appropriate for your group. Please note: Parties, over occupancy or any noise that disturbs neighbors is absolutely prohibited and will result in immediate eviction and forfeiture of security deposit. 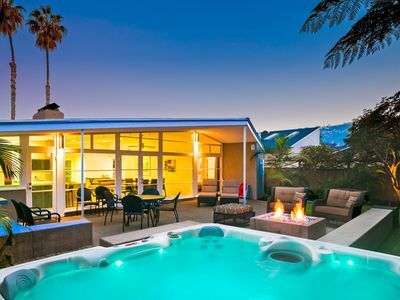 Welcome to Sunset Pointe, named for the spectacular nightly sunsets over the Pacific Ocean. 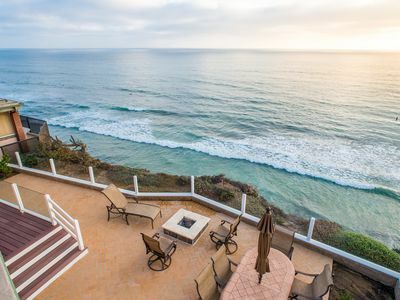 This custom designed vacation rental home boasts shimmering ocean and sweeping panoramic views that extend along San Diego’s magnificent coastline. This is truly a paradise at the water's edge; so close to the ocean that as you gaze westward you will feel you are staying on luxury yacht. 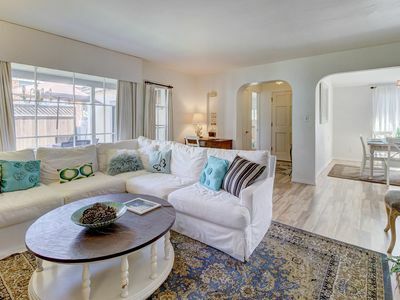 Set in the prestigious Bird Rock neighborhood in La Jolla, California, Sunset Pointe captures the California lifestyle in an elegant setting with sumptuous finishes and amenities. The interior design is refined in its elegance and style, and the furniture and luxurious appointments are beautifully matched with only the finest materials. At nearly 4,000sq. 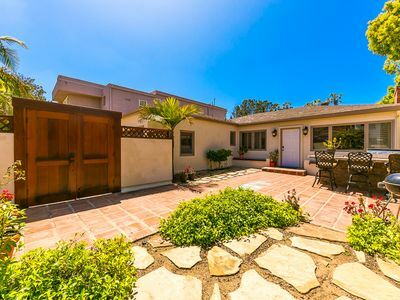 ft. this is a light filled home with an open floor plan featuring special indoor/outdoor living spaces that connect to awe inspiring postcard views. Upon entering the gated, enclosed front courtyard you’ll be greeted by a lushly landscaped space and sunny patio with an outdoor dining table. 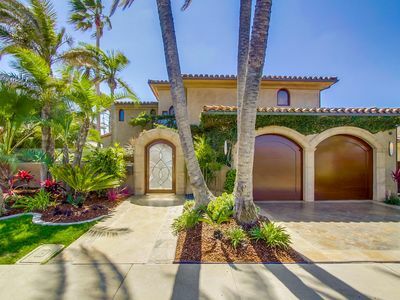 From there, the artistic glass front doors beckon and open up to a hallway that leads straight to the ocean! Warm colors and beautiful hardwood floors off set the azure background and create the mood for instant relaxation. 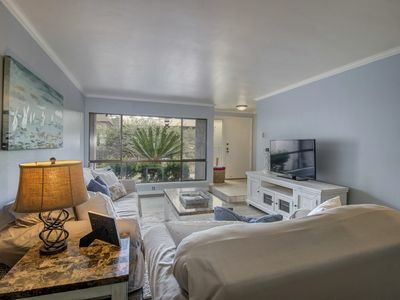 This vacation rental features an open concept floor plan that is made for entertaining indoors and out, and boasts unobstructed water views from the living room and kitchen. 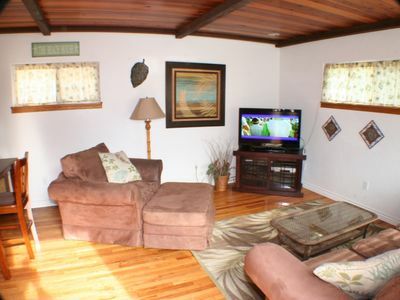 The living room has comfortable seating with a fire place and flat screen HDTV. There’s a beautiful gourmet chef’s kitchen, featuring a stone breakfast bar, stainless appliance package, granite counters and custom hardwood cabinetry. 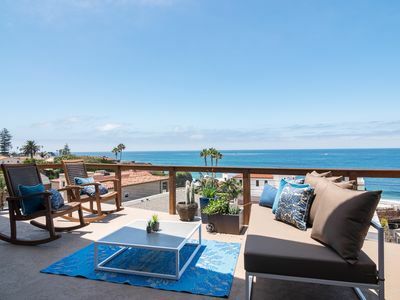 Adjacent is an ocean front dining nook with sweeping views all the way down the coast. Step outside the oversize glass sliding doors and feel the cool ocean breezes on the ocean front veranda framed by the extraordinary glass and wood framed deck above. 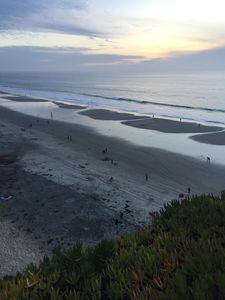 This is the place you’ll spend your time gazing out over the blue Pacific Ocean, where you’ll be treated to both surfers and dolphins playing in the waves during the day and the spectacular sunsets in the evenings. Turn your gaze south and you’ll see the Crystal Pier in the distance, Pacific Beach, Mission Beach, and all the way to Point Loma. 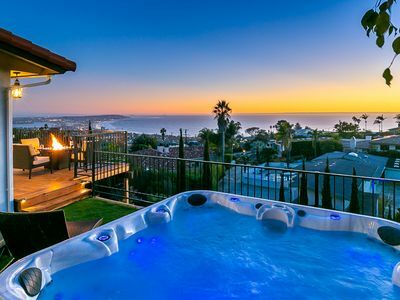 When you’re ready, take a dip in the water fall lap pool alongside the home, and the Jacuzzi is always a great place to take a soak and unwind to the sounds of the ocean. The master suite is a sight to behold. 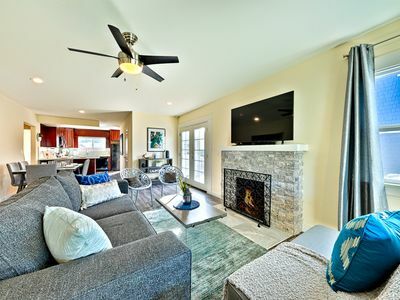 A spacious retreat that features a king size bed, lounge seating, flat-screen HDTV, fireplace, and an expansive wood and glass ceiling that lets in the natural light and moonlight. The adjacent master bath has an oversize jetted soaking tub, open stone shower and large dual-sink vanity. 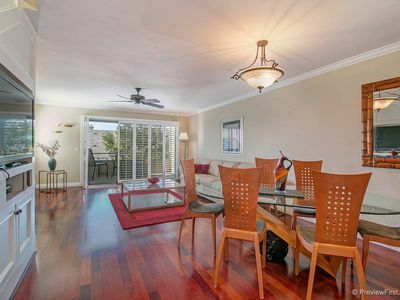 From the master, step through the floor to ceiling sliding glass doors onto an incredible ocean view deck made of bullet proof glass flooring and glass railings that will make you feel like you are floating above the terrace below and the ocean beyond! 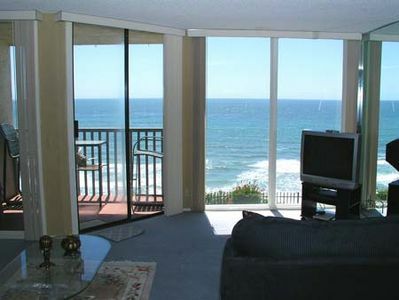 This is the place to bask in the sun and let the gentle sounds of the ocean lull you to sleep. The guest bedroom adjacent to the master suite features polished hardwood flooring, a queen bed and floor to ceiling glass sliding doors that open up to its own glass ocean view deck. The 3rd bedroom is a separate private suite with a queen bed, walk-in closet, flat screen HDTV and en-suite bath. 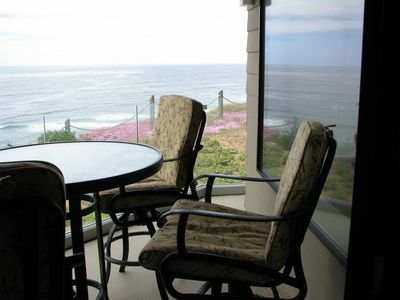 Just off this suite is a bistro set overlooking the pool and spa and ocean beyond; the perfect place to enjoy a morning cup of coffee watching the waves beyond. From here there is a convenient spiral staircase to access the pool and spa and ocean front veranda. 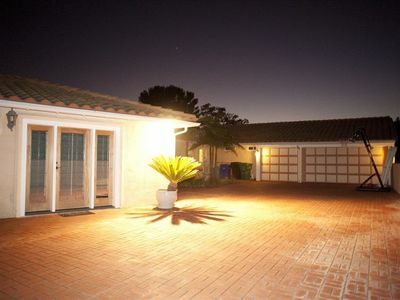 Sunset Pointe is fully gated and enclosed for security and privacy. 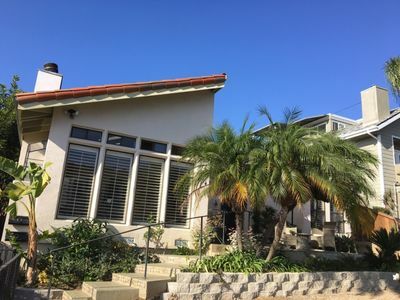 Just around the corner are stairs and access to the ocean and popular surf breaks and you can walk along the bluffs to the sandy beaches of Pacific Beach just to the south. This is a one-of-a-kind vacation is perfect for a romantic get-a-way or couples retreat. We invite you to experience the unparalleled peaceful tranquility of Sunset Pointe. Call or email us to learn more. Note: Bikes, beach chairs and toys are not included; however, Bluewater has arranged discounts with local providers that can deliver custom orders based on your specific needs. Ask your vacation planner for details. Please note: Spices, baggies, aluminum foil, etc. are not supplied. Please let us know of you require a grocery stocking service. Please note: Furnishings and amenities are subject to change. All occupants and use of home must be approved by management and reservations may be declined or canceled at management's discretion. All rates are subject to change until finalization of reservation. Please make sure you are comfortable with these policies and closely read the contract terms and conditions before booking. 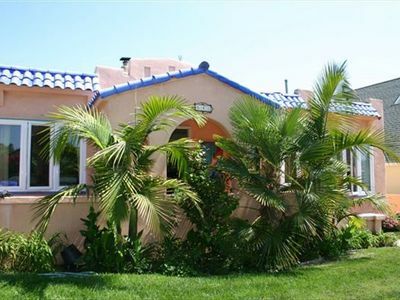 Air conditioned cottage w/ patio & yard - blocks to beach, shops & restaurants! Steps to the Sand - Charming Beach Bungalow with Pool! 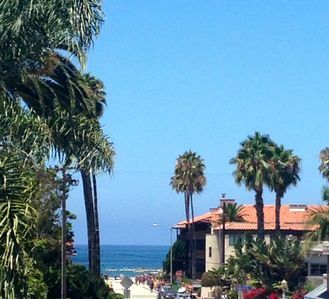 Fabulous home blocks to the beach! 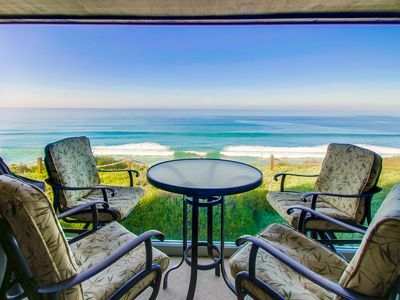 20% OFF APR+MAY - Gorgeous Home w/ Outdoor Living + Amazing Ocean Views!